A new survey by the American Library Association shows that 99.3% of public libraries offer free access to the web even if you don’t have a PC and 67% offer e-books. Summer just got a whole lot cooler. The American Library Association has just published its newest investigation into the state of the nation’s public libraries, and the news is…actually rather good. You may think that odd in an era of ubiquitous alternative distractions to reading a real book–from iPads to Kindles–but it’s really these new high-tech devices, along with the Internet that’s keeping libraries flourishing. The one fly in the ointment is that funding cuts seem to be threatening many services. While just a few years ago public libraries were all about borrowing books to read, or finding somewhere to study alongside handy text resources, the Net has changed much of this. 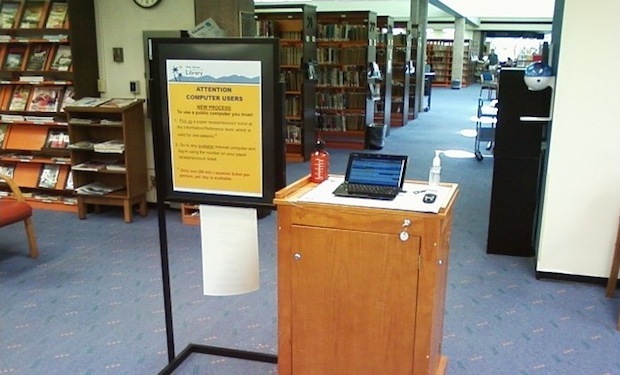 Now 99.3% of the U.S.’s libraries offer Net access, via a public PC or open Wi-Fi, and 64% of libraries say they’re the only free access point in their communities. With that figure stepping up to 73% for rural libraries, and 70% of libraries reporting that public use of their Net facilities increased in 2010, it’s easy to see that the public library is still hugely relevant in a digital era. But what are people doing in libraries nowadays? It seems that Internet nexus is extremely handy for people seeking jobs, via vacancy listings and other resources: 88% of libraries offer this, and 72% say their staff are helping clients fill in application forms. Meanwhile, 25% of libraries are in partnerships with government agencies and other groups to build e-government services–almost double the 13% figure from just two years ago. Though we live in a digital era that obviates many reasons to travel, it seems the library still is the social hub for data sharing. Meanwhile, the percentage of libraries offering e-books has lurched upward over recent years, and now more than two thirds (67.2%) of all libraries offer e-book access in some form. That figure is up from 65.9% last year, and a measly 38.3% in 2007. We can maybe see where Amazon’s selling all its Kindles from the next statistic though: 87% of urban libraries have e-books, compared to just 52% of rural ones. Despite this compelling evidence that libraries continue to be vital hubs in many communities, the economic reality is not that great: 60% of libraries reported flat or decreasing budgets for this year, up from 40% in 2009. Similarly 16% of all libraries sliced their opening hours as budget cuts (and possibly increased tech-driven operating costs) impacted, and 17 states said that some libraries closed last year. Have local governments overlooked the humble library, with politicians forgetting that the library PC is a vital lifeline for millions of U.S. jobseekers? Considering recent unemployment news, this seems shortsighted.